I Christopher A. Brown Declare under the laws of perjury of the State of California that I have never used the word "telepathy" prior to September 8, 1998 in ANY legal pleading verbal or written. At lines 13 through 20 the defendants Attorney unnecessarily (as a defense) presents the plaintiffs response to admissions to enter into legal pleading the actual descriptions of the hypnotic activities utilized to create a somnambulistic state. 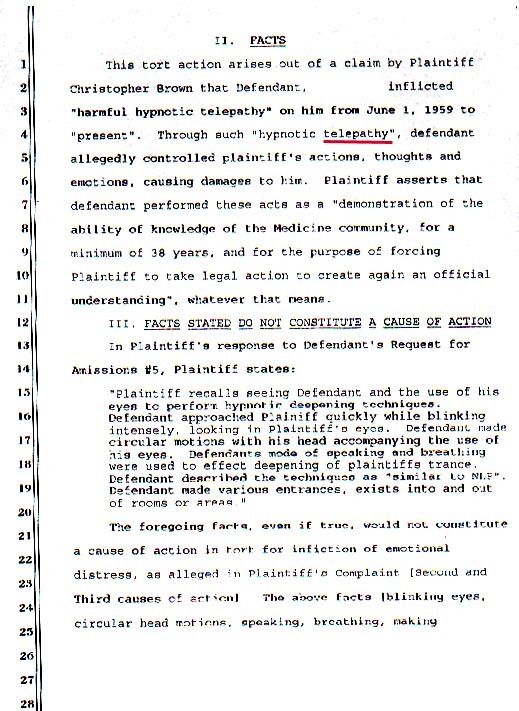 The word telepathy was intentionally derived by inference from the plaintiffs responses to interrogatories and included in the opening statement using the plaintiffs legal action as a vehicle for that purpose. Since this time I located Blacks Law Dictionary, 1933, page 911 on Hypnotism.